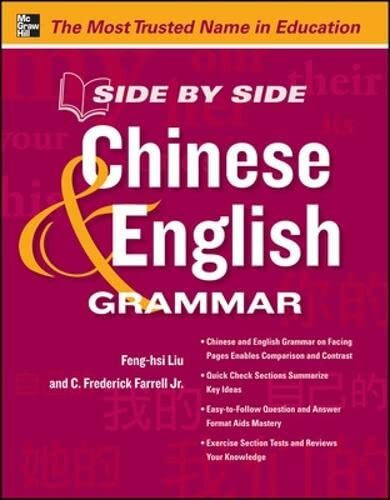 [PDF] Side by Side Chinese and English Grammar | Free eBooks Download - EBOOKEE! Description: Learn and review Chinese grammar at a glance Of all the obstacles you face while learning a new language, grammar is one of the toughest. But now there's a way to learn the subtleties of grammar without all the headaches. Side by Side Chinese & English Grammar is the perfect tool to help you understand the similarities and differences between English and Chinese grammar. By learning Chinese grammar through comparisons to your native English language, you are able to build on what you already know. You will be better able to understand and remember Chinese grammar while writing, speaking, and being tested on Chinese usage. This innovative grammar guide includes: Clear and comprehensive introductions to the parts of speech, explaining their functions and answering common questions about them Quick Check sections that summarize main ideas Appendices that identify possible grammar trouble spots, such as measure words and individual classifiers Numerous verb charts with side-by-side Chinese and English translations for easy understanding of each tense's meaning An exercise section with answer key to test and review your knowledge Side by Side Chinese & English Grammar gives you a firm grasp of the structure of both languages and sets the stage for true language mastery. No comments for "[PDF] Side by Side Chinese and English Grammar".